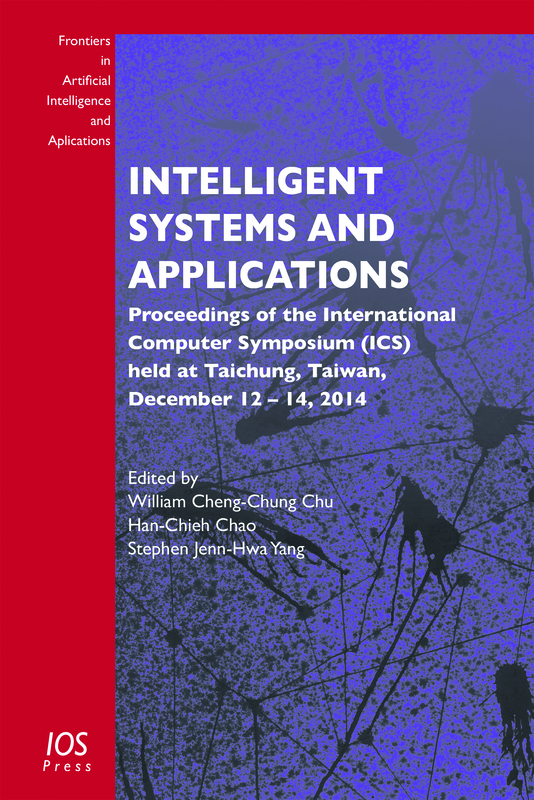 This book presents the proceedings of the International Computer Symposium 2014 (ICS 2014), held at Tunghai University, Taichung, Taiwan in December. ICS is a biennial symposium founded in 1973 and offers a platform for researchers, educators and professionals to exchange their discoveries and practices, to share research experiences and to discuss potential new trends in the ICT industry. Topics covered in the ICS 2014 workshops include: algorithms and computation theory; artificial intelligence and fuzzy systems; computer architecture, embedded systems, SoC and VLSI/EDA; cryptography and information security; databases, data mining, big data and information retrieval; mobile computing, wireless communications and vehicular technologies; software engineering and programming languages; healthcare and bioinformatics, among others. There was also a workshop on information technology innovation, industrial application and the Internet of Things. ICS is one of Taiwan's most prestigious international IT symposiums, and this book will be of interest to all those involved in the world of information technology. Editors: Chu, W.C.-C., Chao, H.-C., Yang, S.J.-H. The robotics industry is growing rapidly, and to a large extent the development of this market sector is due to the area of social robotics – the production of robots that are designed to enter the space of human social interaction, both physically and semantically. Since social robots present a new type of social agent, they have been aptly classified as a disruptive technology, i.e. the sort of technology which affects the core of our current social practices and might lead to profound cultural and social change. Due to its disruptive and innovative potential, social robotics raises not only questions about utility, ethics, and legal aspects, but calls for “robo-philosophy” – the comprehensive philosophical reflection from the perspectives of all philosophical disciplines. 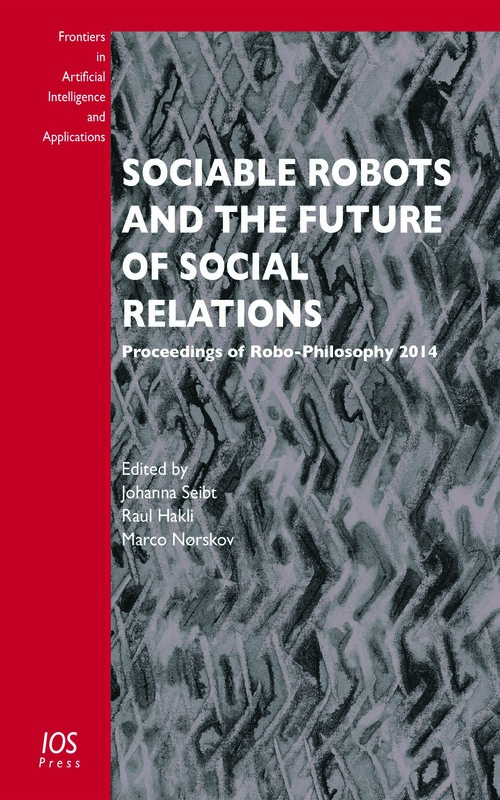 This book presents the proceedings of the first conference in this new area, “Robo-Philosophy 2014 – Sociable Robots and the Future of Social Relations, held in Aarhus, Denmark, in August 2014. The short papers and abstracts collected here address questions of social robotics from the perspectives of philosophy of mind, social ontology, ethics, meta-ethics, political philosophy, aesthetics, intercultural philosophy, and metaphilosophy. Social robotics is still in its early stages, but it is precisely now that we need to reflect its possible cultural repercussions. This book is accessible to a wide readership and will be of interest to everyone involved in the development and use of social robotics applications, from social roboticists to policy makers. Editors: Seibt, J., Hakli, R., Nørskov, M.
Within the last three decades, information modelling and knowledge bases have become essential subjects, not only for academic communities related to information systems and computer science, but also for businesses where information technology is applied. 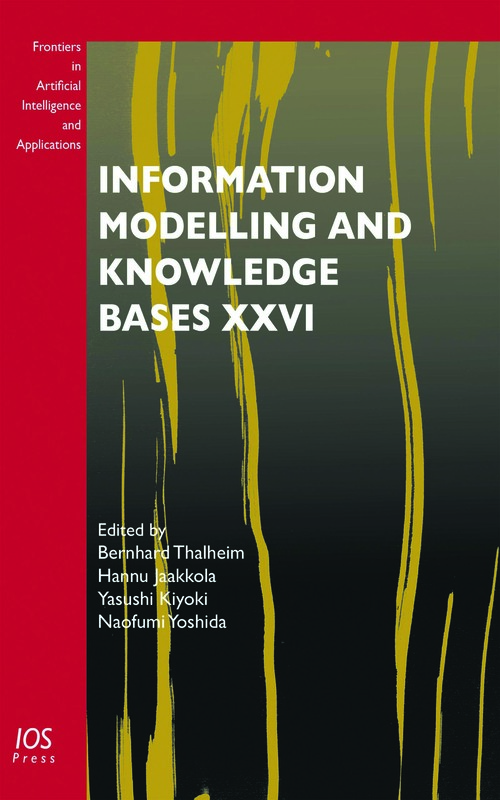 This book presents the proceedings of EJC 2014, the 24th International Conference on Information Modelling and Knowledge Bases, held in Kiel, Germany, in June 2014. The main themes of the conference were: conceptual modelling, including modelling and specification languages, domain specific conceptual modelling, and validating and communicating conceptual models; knowledge and information modelling and discovery, including knowledge representation and knowledge management, advanced data mining and analysis methods, as well as information recognition and information modelling; linguistics modelling; cross-cultural communication and social computing; environmental modelling; and multimedia data modelling and systems, which includes modelling multimedia information and knowledge, content-based multimedia data management, content-based multimedia retrieval as well as privacy and context enhancing technologies. This book will be of interest to all those who wish to keep abreast of new developments in the field of information modelling and knowledge bases. Editors: Thalheim, B., Jaakkola, H., Kiyoki, Y., Yoshida, N.
The JURIX conferences are an established international forum for academics, practitioners, government and industry to present and discuss advanced research at the interface between law and computer science. Subjects addressed in this book cover all aspects of this diverse field: theoretical – focused on a better understanding of argumentation, reasoning, norms and evidence; empirical – targeted at a more general understanding of law and legal texts in particular; and practical papers aimed at enabling a broader technical application of theoretical insights. This book presents the proceedings of the 27th International Conference on Legal Knowledge and Information Systems: JURIX 2014, held in Kraków, Poland, in December 2014. The book includes the 14 full papers, 8 short papers, 6 posters and 2 demos – the first time that poster submissions have been included in the proceedings. The book will be of interest to all those whose work involves legal theory, argumentation and practice and who need a current overview of the ways in which current information technology is relevant to legal practice. Databases and information systems are the backbone of modern information technology and are crucial to the IT systems which support all aspects of our everyday life; from government, education and healthcare, to business processes and the storage of our personal photos and archives. This book presents 22 of the best revised papers accepted following stringent peer review for the 11th International Baltic Conference on Databases and Information Systems (Baltic DB&IS 2014), held in Tallinn, Estonia, in June 2014. The conference provided a forum for the exchange of scientific achievements between the research communities of the Baltic countries and the rest of the world in the area of databases and information systems, bringing together researchers, practitioners and Ph.D. students from many countries. The subject areas covered at the conference focused on big data processing, data warehouses, data integration and services, data and knowledge management, e-government, as well as e-services and e-learning. Editors: Haav, H.-M., Kalja, A., Robal, T.
This book presents 34 original papers accepted for presentation at the 17th International Conference of the Catalan Association for Artificial Intelligence (CCIA 2014), held in October 2014 in Barcelona, Spain. The Catalan Association for Artificial Intelligence (ACIA), was created in 1994 as a non-profit association to promote cooperation among researchers from the Catalan-speaking artificial intelligence research community. Conferences are now held annually throughout the Catalan-speaking countries. The papers in this volume have been organized around different topics, providing a representative sample of the current state-of-the-art in the Catalan artificial intelligence community and of the collaboration between ACIA members and the worldwide AI community. The book will be of interest to all those working in the field of artificial intelligence. Editors: Museros, L. , Pujol, O., Agell, N.
In the modern information society, there is an ever-growing need for improved natural language processing and human language technologies.This book presents the proceedings of the Sixth International Conference 'Human Language Technologies – The Baltic Perspective' (Baltic HLT 2014) held in Kaunas, Lithuania in September 2014. The Baltic HLT conferences provide an important forum for gathering and consolidating ideas, and are an opportunity for the Baltic countries to present important research results to an international audience. The book contains 39 long and short papers presented at the conference. These cover a wide range of topics: syntactic analysis, sentiment analysis, co-reference resolution, authorship attribution, information extraction, document clustering, machine translation, corpus and parallel corpus compiling, speech recognition, synthesis and others. The book is divided into three main sections: speech technology, methods in computational linguistics, and preparation of language resources. This book will be of interest to anyone whose work involves the use and application of computational linguistics and related disciplines. Editors: Utka, A., Grigonytė, G. , Kapočiūtė-Dzikienė, J., Vaičenonienė, J. Formal Ontology in Information Systems (FOIS) is the flagship conference of the International Association for Ontology and its Applications (IAOA). Its interdisciplinary research focus lies at the intersection of philosophical ontology, linguistics, logic, cognitive science, and computer science, as well as in the applications of ontological analysis to conceptual modeling, knowledge engineering, knowledge management, information-systems development, library and information science, scientific research, and semantic technologies in general. As in previous years, FOIS 2014 was a nexus of interdisciplinary research and communication. The current proceedings is divided into four main sections, dealing with: foundations; processes, agency and dispositions; methods and tools; and applications. The last of these covers a broad spectrum of areas, including in particular biology and medicine, engineering, and economy. For the first time in its history, the conference hosted a special track: an ontology competition, the aim of which was to encourage authors to make their ontologies publicly available and to allow them to be evaluated according to a set of predetermined criteria. Papers discussing these ontologies can also be found in this volume. The book will be of interest to all those whose work involves the application of ontologies, and who are looking for a current overview of developments in formal ontology. Argumentation, which has long been a topic of study in philosophy, has become a well-established aspect of computing science in the last 20 years. This book presents the proceedings of the fifth conference on Computational Models of Argument (COMMA), held in Pitlochry, Scotland in September 2014. Work on argumentation is broad, but the COMMA community is distinguished by virtue of its focus on the computational and mathematical aspects of the subject. This focus aims to ensure that methods are sound – that they identify arguments that are correct in some sense – and provide an unambiguous specification for implementation; producing programs that reason in the correct way and building systems capable of natural argument or of recognizing argument. The book contains 24 long papers and 18 short papers, and the 21 demonstrations presented at the conference are represented in the proceedings either by an extended abstract or by association with another paper. The book will be of interest to all those whose work involves argumentation as it relates to artificial intelligence. Editors: Parsons, S., Oren, N., Reed, C., Cerutti, F.
Software is the essential enabling means for science and the new economy. It helps us to create a more reliable, flexible and robust society. But software often falls short of our expectations. Current methodologies, tools, and techniques remain expensive and are not yet sufficiently reliable, while many promising approaches have proved to be no more than case-by-case oriented methods. This book contains extensively reviewed papers from the thirteenth International Conference on New Trends in software Methodology, Tools and Techniques (SoMeT_14), held in Langkawi, Malaysia, in September 2014. The conference provides an opportunity for scholars from the international research community to discuss and share research experiences of new software methodologies and techniques, and the contributions presented here address issues ranging from research practices and techniques and methodologies to proposing and reporting solutions for global world business. The emphasis has been on human-centric software methodologies, end-user development techniques and emotional reasoning, for an optimally harmonized performance between the design tool and the user. Topics covered include the handling of cognitive issues in software development to adapt it to the user's mental state and intelligent software design in software utilizing new aspects on conceptual ontology and semantics reflected on knowledge base system models. This book provides an opportunity for the software science community to show where we are today and where the future may take us. Editors: Fujita, H., Selamat, A., Haron, H.